An image of a ship like the Stanbank, as no image of the actual ship is readily available as she was only afloat for a few months. From a post-war advertisement for the Stan Line, from Fairplay Magazine of July 3, 1947. The British steam ship Stanbank was built in 1942 by William Pickersgill and Sons Limited of Sunderland, England. Her owners were J. 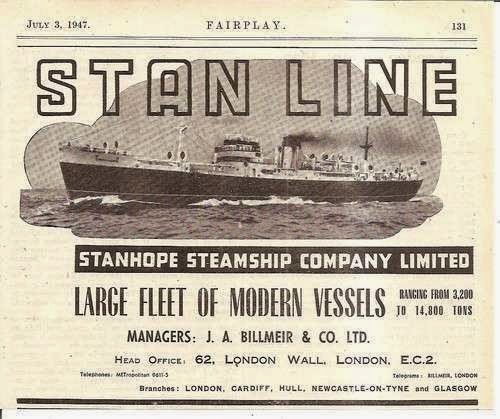 A. Billmeir and Company, Limited of London, also known as the Stanhope Steamship Company Limited – their ships began with the prefix “Stan.” The ship was 5,966 gross registered tons (GRT) and she was 415 feet long, 54.1 feet wide and 33.1 feet deep. Because the ship was sunk on what must have been its maiden cargo voyage (having sailed in ballast from the UK to New York following being launched), there are no images of the vessel nor much history to refer to, as it was only afloat a few months. A single triple-expansion Clark George engine developed 415 net horsepower and propelled the steel hull at 10 knots. The ship was armed with a 4-inch gun aft, two Oerlikon cannons, two Twin-Marlin machine guns, a weapon called a “pig trough”, four parachute rockets and kites. The 49 men on board were led by Captain George Albert Niddrie. Second Radio Officer Frederick Clarke Smith was 21 years of age, as was DEMS (defensively equipped merchant ships) gunner George Laidler Bell. Able Seaman John Barker Round was two years older than them. Overall there were six naval or army gunners on board to man the defenses and 43 merchant sailors and officers. The cargo manifest of the Stanbank is a highly detailed document spanning four pages single spaced. The total tonnage loaded was 6,484 tons. Her ETA at Port Sudan was given as June 25th. The cargo was consigned for Suez, Ankara Turkey (medicines), El Kebir, Aden, the Department of Munitions of Supplies, Canada, the British Purchasing Commission, Navy Army Air Force Institute (491 tons of beer), and British Food Commission, among others. There were airplane fuselages on deck, manuals, spare parts, for Curtiss Wright Kitthawks (six), 2 million 30-caliber links of ammunition, 1,611 tons of bituminous coal, nearly 2,000 loose tires with tubes, boxes for Massawa, Ethiopia, 12 Bofors cannons, 302 tons of Lend-Lease pork sausages, 207 tons of evaporated milk, and tens of thousands of drums of lubricating oils from Radbill Oil Company as well as Valvoline, Standard Oil, Keystone Oil. Most of the airplane fuselages where stowed on the hatches on deck. Stanbank departed New York Harbor on Friday the 1st of May 1942 at 8:00 am. The patrol of the German submarine U-103 under Kapitänleutnant Werner Winter lasted for six days in the area, all of it inbound. Starting after being refueled in early May, Winter headed southeast from a position north of the island. On the 5th of May his route intersected quite by chance with the outbound Stanbank, with predictable results. The attack took place 210 nautical miles northeast of Bermuda and 540 nautical miles southeast of Nantucket Island. The weather at the time of U-103’s attack was fine with good visibility – the sea was described as smooth and the breeze light. Captain Niddrie had been following the routing instructions given to him in New York and was steering southeast at 9.5 knots. At 2:00 am on Tuesday the 5th of May the captain “heard a muffled explosion which appeared to be deep down.” The torpedo had burrowed its way into the starboard side into the Number Two hold and beneath the bridge. There were four cases of airplane fuselages on the Number Two hatch cover. Captain Niddrie observed that “A large column of water was thrown up mast high but I did not see any smoke nor did the explosion leave any smell. I could hear the cargo running out from No. 2 Hold and gathered that there was a large hole in the ship’s side.” His cabin was crushed and he could not retrieve any ship’s papers from it. Fortunately the Chief Engineer stopped the engines on his own initiative. However the confidential codes were thrown overboard in a weighted perforated box and as ordered the Radio Operator tried to send an SOS however it was never received. Niddrie then focused on the lifeboat and life raft situation. The large starboard lifeboat was destroyed by the torpedo explosion, however the captain tried to free and lower the other starboard lifeboat. He was unsuccessful in doing this because he could not convince the men to come over to the side of the damage. By now the ship was listing five degrees to starboard and sinking slowly by the head. The men focused their attention on releasing the two port lifeboats, one of them a small “jolly boat” and the other larger. They also managed to cut away three life rafts. The jolly boat with 11 men in it pulled away from the doomed Stanbank and the men oared away, where they were approached by U-103. The Second Mate in charge of the boat, William Christie Stark, aged 26, was asked by Korvettenkapitän Winter or his subordinate the name and destination of the ship, to which he replied “That’s one up on Roosevelt!” Winter then provided the survivors with a packet of 25 cigarettes and a box of French matches and said the war would soon be over. U-103 then submerged and the merchant mariners did not see it again after 2:50 am. The runic emblem of Victor Schutze’s U-103. Captain Niddrie remained on his ship for 10 minutes after the torpedo struck then, after a wistful look around, he boarded the larger port lifeboat and pushed away from his ship. For the next few hours until daylight the two boats bobbed around in the vicinity of the wreck At dawn Captain Niddrie ordered eight men each on the three rafts, nine men under the second officer on the jolly boat, and 16 men including Niddrie in the larger boat. Since there was no wind they began rowing west, in the general direction of Bermuda. Starting on the first day the young Second Officer, William Stark, agitated to take his smaller boat and set off for Bermuda on its own. At first Niddrie demurred, saying that as they had sent out an SOS they should remain in the vicinity of the sinking. But by Thursday the 7th of May there was no sign of rescue ships or planes and so at 1:30 Niddrie let the second officer choose the eight ablest men (Bell, Derry, Foreman, Jameson, McPhee, Round, Skinner, and Smith) and the nine of them set off without any rafts, heading for Bermuda. They were over the horizon in three hours. None of the nine men were ever seen again. For that day and the following (the 8th) the 40 remaining men rowed west. Niddrie rationed the water to four ounces per man three times a day. At breakfast they had three spoonfulls of condensed milk and at lunch two biscuits with pemmican spread on them as well as six milk tablets and in the evening 6 bars of chocolate. During this time all three rafts were being towed by the large lifeboat and progress was understandably slow. Then on Saturday the 9thof May two of the rafts were stripped of supplies and men and cast adrift, leaving just one raft trailing behind the boat. This contained 13 men: the dozen “Arab” sailors and the chief engineer. During the night the tether connecting both vessels severed and it took Niddrie and his men two hours to find the raft and reconnect the painter. That afternoon a fresh breeze from the southwest sprung up and so they abandoned the third and final raft and all occupied the lifeboat to better enable them to sail. The steam ship Rhexenor which rescued most of the survivors of the Stanbank north of Bermuda in May of 1942. The Rhexenor was completed in March 1923 by the Taikoo Dockyard and Engineering Company of Hong Kong and owned by the Alfred Holt and Company of Liverpool. The ship was 7,957 GRT and could carry 9,860 tons of cargo. She was 477.5 feet long, 58.4 feet wide and 28.5 feet deep and could make an impressive 14.5 knots. Rhexenor covered the 125 miles in about 12 hours, arriving off Saint George’s Bermuda at 10:00 am (some reports said 8:00 am). There was a welcoming committee of volunteers to greet them, consisting of Mrs. Meyer, Mrs. Barnes, Mr. and Mrs. Pierce, Mrs. Snape, Mr. Morris and Mrs. Schwab. They represented the Saint George’s branch of the Bermuda Sailor’s Home – other representatives such as Dickie Tucker and Arthur Harriott had to come up from Hamilton by special train which left the capital at 9:00 am. 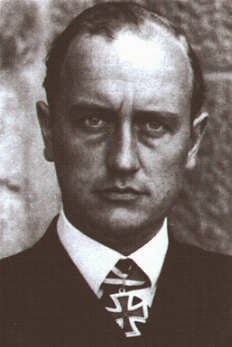 The Rhexenor’s captain on the 3rdof February 1943 when she was sunk in mid-Atlantic by U-217 under Reichenback-Klinke, was Leonard Eccles. The captain was taken prisoner and served the balance of the war in the POW camp Milag Nord. On the 5thof January 1943 both Captain Niddrie and Able Seaman Blake Bremer received the King’s Commendation in London. After the Stanbank attack U-103 turned southwest for a day, then west across the north of Bermuda until turning southwest on the 8th and exiting the area for the Bahamas theater between Bermuda and Hatteras. Having left Saint Nazaire on the 15th of April, the boat was refueled by U-459 500 miles northeast of Bermuda in early May. After entering the Bahamas area midway between Bermuda and Savannah on the seventh, U-103 headed first southwest in the direction of the Straits of Florida and then south along the eastern Bahamas to exit the region via the Windward Passage on the 13th of May. Winter would return two weeks later after devastating attacks on eight other ships, mostly in the Yucatan Channel and the western and southwestern tips of Cuba. U-103’s victims included the Ruth Lykes on the 17th, Ogontz two days later, both Clare and Elizabeth two days after that and on the 23rd and 24th the Samuel Q. Brown and Hector. On the 26th he dispatched the Alcoa Carrier and on the 28th the New Jersey, for total tonnage (including Stanbank) of 42,169 tons sunk. All but the British Stanbank and the Dutch Hector were American ships. On the return voyage Winter again transited the Windward Passage – this time on the 31st of May – and opted to steam east of Inagua and through the Caicos Channel on the first of June. For the next four days he steamed northeast, exiting the area south of Bermuda on the 5th of June and heading for Biscay, which he had left on the 15th of April. On the very day that he passed south of Bermuda Winter was awarded the Knights Cross via radio for an exceptionally successful patrol. Before that his highest award was the Iron Cross First Class. Winter’s career haul amounted to fifteen ships sunk for 79,302 tons – he appears to have been a thorough skipper, as none of his victims escaped merely damaged: all were finished off. The boat returned to Lorient (having left St. Nazaire) on the 22nd of June 1942. Winter would be promoted to Korvettenkapitän in March of 1943. His total of five war patrols amounted to 209 sea days. A member of the crew of 1930, Winter had served on the light cruiser Emden before joining U-boats in 1935. Captured in Brest in 1944, he was released in 1947. After a few years in the Bundesmarinehe retired as a Kapitän zur See, and lived a further two years until 1972 when he passed away in Kiel.